Recently I received an emergency alert on my phone warning of a snow squall. As I looked out my window one moment the sun was out and the next moment there was a blanket of white snow and furious winds gusting through the entire area. It was a drastic change in a matter of minutes. I have never heard of a winter snow squall before or a Polar Vortex. These are terms that I am now familiar with due to the changing of the weather. Being from New York our winters are usually frigid but over the past couple of years, the weather has changed significantly. The winters are colder and the summers are hotter. As a result of climate change becoming a mother may become difficult if you are not in the best environment. I have been pregnant during the summer and it is not comfortable. It can be exasperating on the body. New research states that extreme temperatures during pregnancy can cause complications for mom and baby. “The potential increases in both the number of pregnant women and maternal heat exposure suggest an alarming effect that climate change may have on reproductive health,” the study said. Reported in the Journal Demography, the study found that high temperatures have a significant negative effect on fertility and birth rates, and the research projects that as climate change drives temperatures up and increases the number and severity of heat waves, getting pregnant may become harder than ever. In other words, hot weather may harm fertility. Men especially need to be alarmed because sperm production tends to fall in hot weather. The Journal of the American Heart Association also found that a larger number of babies will probably be born with congenital heart defects between 2025 and 2035 due to their mothers’ exposure to higher temperatures, triggered by climate change, while pregnant. Hot weather may not affect people in parts of the world where the climate is already hot because their bodies have already acclimated to their environment. But for people who are not used to extremely high temperatures, this could be cause for concern. 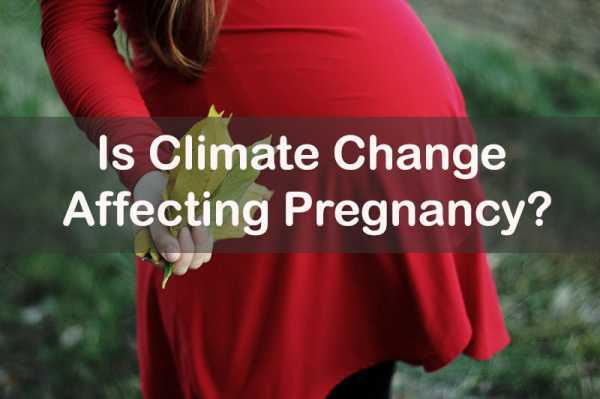 Bottom line our climate cannot be another hurdle for women struggling to become pregnant. Studies say global warming is the reason why this may be happening but more studies need to be done. As our climate becomes more problematic it is important that we take climate change very seriously and hold ourselves accountable of hope we treat our planet. We must all do our part!